TPC Harding Park Hole 3: This first par three of the day is uphill to a well-designed green between two bunkers that allow for many pin placements, most of which require a thoughtful shot. 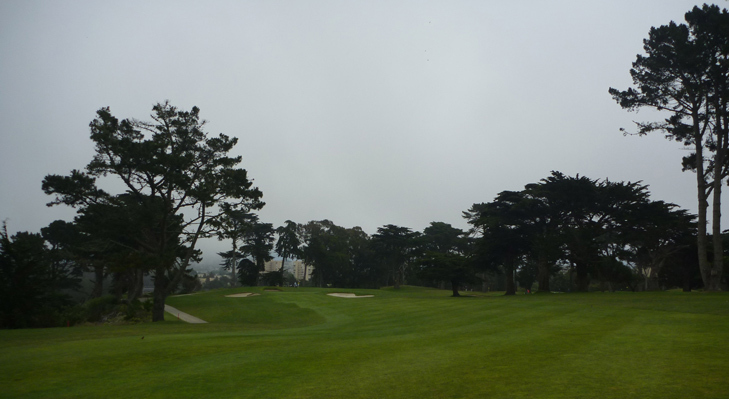 TPC Harding Park Hole 10: The back nine starts with a dogleg left par five that skirts the edge of the property. Left is bad from tee to green, but avoiding the bunkers along the way is a good idea too..
TPC Harding Park Hole 14: Long and punishing, this straight par four requires to solid shots to reach the green. There are large trees on both sides of the fairway and a greenside bunker to avoid. TPC Harding Park Hole 16: This short par four is tight with a massive tree to the right of the fairway that will create havoc with any tee shot right. Left is the better approach to the green, but too far left will find the hazard. The green is well protected, small, and undulating. TPC Harding Park Hole 18: The final tee shot of the day is one of the more intimidating ones in all of golf. The golfer can decide how much of the lake / corner to cut off, but even after crossing, the trees on the left can still be in play as the green on this dogleg is cut up against the lake again and is protected by large trees on the left. A more conservative approach will take the trees out of play, but might find the bunkers through the fairway and will definitely leave a long approach to the final green of the day. TPC Harding Park to host 3 major PGA Events. Many More Northern California Golf Reviews for you to peruse.